One of the components of well-being, based on research by Martin Seligman and many others, is meaningful relationships. In a study done in the 1960s on the residents of the small community of Roseto, Pennsylvania, and reported on by Malcolm Gladwell in his book Outliers, researchers found that all of the residents in the community, who had immigrated from Roseto, Italy, had low incidences of heart disease and other illnesses and enjoyed long lives, despite the fact that they ate poorly, exercised little, and smoked heavily. Researchers were intrigued and spent several years figuring out the key to the unusual longevity and health the Roseto community enjoyed. Finally, it was determined that the key to the community’s good health was the tight-knit community, the feeling that there was always someone to whom residents could turn if they had a problem. Families and extended families were large and well-connected, and there was a deep sense of community in the town. We are social creatures. Many of the things we do are for social reasons, whether or not we realize it. I am convinced that the terrible swath of gun violence in the US has come from increasing levels of isolation and loneliness in our society. One of the reasons our family moved to North Carolina was to live closer to extended family and to cultivate a community of friends and neighbors with whom we had close relationships. In order to cultivate those relationships, we’ve had to work at starting and nurturing those friendships. Mr. ThreeYear and I picked the neighborhood we did precisely because it was bike able, kid-friendly, and “warm.” It’s lived up to our expectations. Just last week, Little ThreeYear was invited to ride his bike in the cup-de-sac with some classmates. Mr. ThreeYear and I have met all of our neighbors, and have started several friendships with neighbors with similar interests. Despite our efforts, families with kids are busy with work, after-school activities, homework, and sports on the weekend. So finding time to hang out with our newfound friends will require some concerted effort on our parts. The idea of “entertaining” seems a quaint notion from my parents’ era, when adults came over, had a few too many drinks, and let the kids run around, forgotten (heaven for the kids). But having people over to your home is one of the best ways to put yourself out there and share the art of hospitality, so that you have a relaxed place to sit and chat, and if you have kids, you can let them run around and play. So many people today, though, perhaps intimidated by Pinterest, have given up having people over for dinner. Couples might go out together to a restaurant, but then both couples have to hire a babysitter (plus pay for eating out) which is expensive! Or, they might feel that their homes aren’t decorated nicely enough or aren’t big enough for company. Here’s the deal, though: I have never been invited over to someone’s home and thought, “Oh how terrible, I’m leaving immediately. This place is too small/not decorated nicely enough/not perfect enough.” I think, “wow, I am so happy to be invited over to this person’s house.” And I inevitably find one (or more!) things I like better about their house than mine, and one (or more) that I like better about my house. We’re social and we compare. It’s a given. 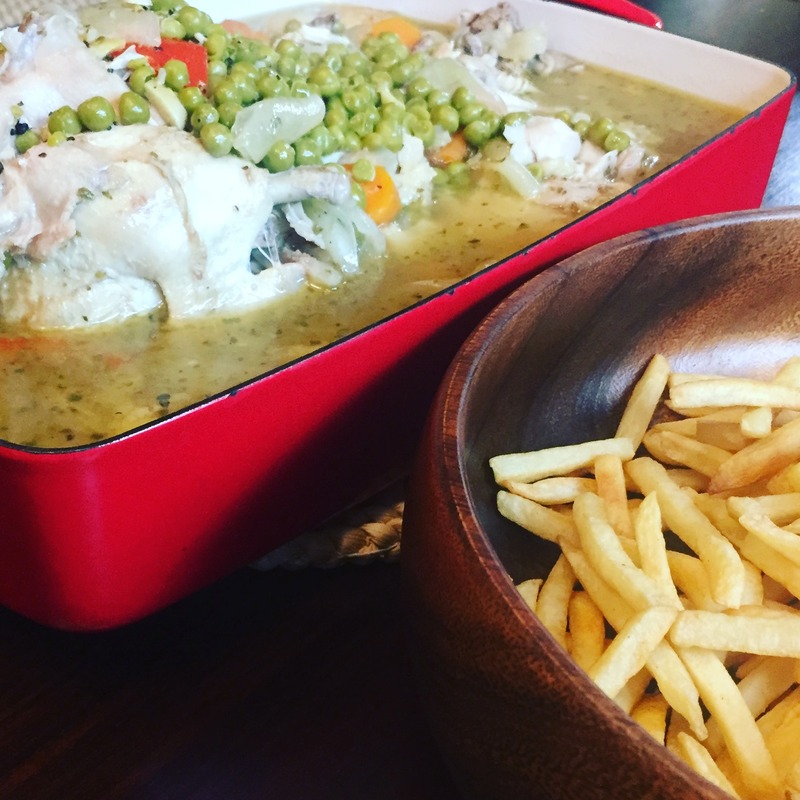 A frugal Chilean meal I often serve: Pollo con arvejas and French fries. But I always leave glad that I was invited over, so grateful that I got to know the person (or family) better, and happy for delicious food and good company. One reason people hesitate to entertain (and I admit, I’ve been there, too) is the cost. It can be very expensive to have people over and buy special food and drink. It takes a lot of time to clean up before and after having people over. So here are some ideas I’ve gathered, over the years that I’ve been entertaining, to help make both the $$$ and time aspect easier for having people over to your house and building community. Most of the time, I spend an extra $20 or so on ingredients for guests, over and above my usual grocery purchases. Most of that is wine, since I don’t drink it and Mr. ThreeYear rarely does. I don’t buy flowers (see “Decorating” below for more there). If it’s intimidating to have people over mainly because you don’t know what to make, may I recommend a signature dish? 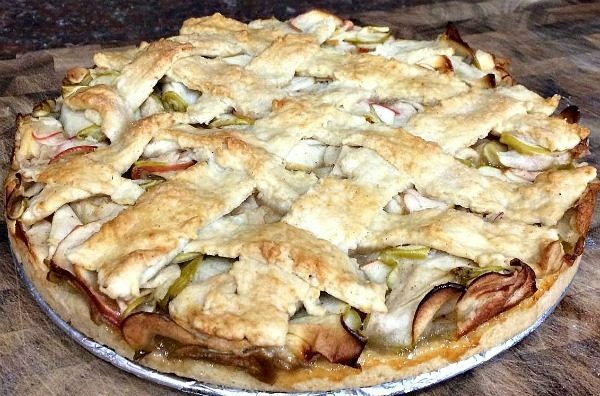 Over the years, I’ve collected some inexpensive and delicious dishes to make for guests. One of my favorites is from Shauna Niequist’s book Bread and Wine. It’s for enchilada casserole. Easy, cheap, freezable. You can make it beforehand (or make two! ), freeze it for months, and then pull it out a few hours beforehand to thaw. Serve with salad, a loaf of French bread, and a bottle of wine (think Kim Crawford Savignon Blanc, fancy and affordable at about $17 a bottle). And then buy a second, cheaper, bottle, for when the guests won’t taste it or care. Or, if you have guests that don’t care, hit up Trader Joe’s or Aldi and get the $8 bottle of wine that’s rated 89 points. Chilean wines tend to be a great deal and delicious. If my guests are vegetarian/vegan, I make this casserole and serve it with a salad and bread. It is labor intensive but I’ve made it dozens of times and I know it’s good. I substitute fancy cheese for parmesan. Sometimes, I’ll do Chilean night. Since Mr. ThreeYear is Chilean, I will occasionally make a big batch of empanadas and freeze them (notice a trend here?) and serve them with Chilean salad (tomatoes and onions in a vinaigrette) and, you guessed it, a loaf of bread. For these nights, we might serve a Chilean red (Concha y Toro‘s Casillero del Diablo Carmenere at $11 a bottle is a frequent choice–Carmenere is a grape only found in Chile). We also might serve a signature cocktail (see below for more details). What if the kids don’t eat the food? Here’s what I do: buy two boxes of knock-off Kraft Mac n Cheese at Aldi (total cost, $.66 for two boxes) and mix it up for the kiddos. I usually have hot dogs on hand. That’s optional, though. If the kids don’t eat what’s served, that’s their parents’ job to worry about, not yours. Cocktail pun. Here we go. If dinner seems too overwhelming, invite new friends over for cocktails and appetizers. Here’s where a signature drink helps. Buying a ton of wine, beer, and liquor to satisfy your guests’ every-possible desire would cost a fortune. So give them a very limited choice. If, in the rare event, they don’t like your choice, you can offer soda water or a Coke. We have one signature drink that we’ve mastered and that people love. 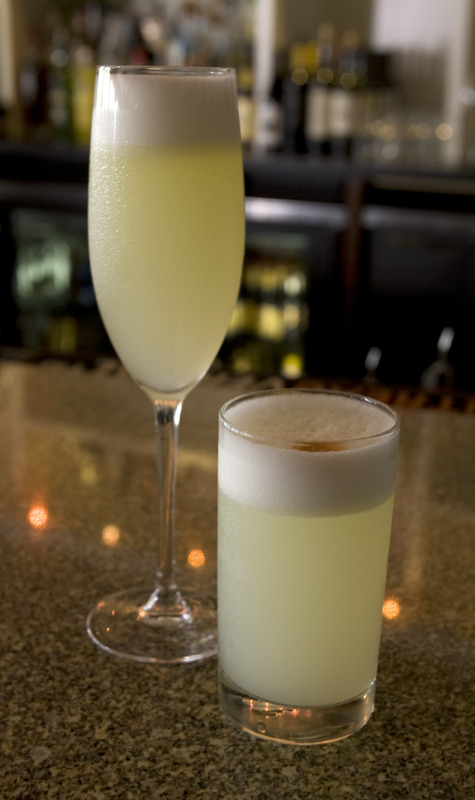 It’s called a Pisco Sour, and it’s absolutely delicious. The hardest part is finding Pisco, which is a Chilean liquor made from grapes. It tastes a bit like tequila. Here’s how you make it. in a blender. Taste–adjust ingredients until it tastes like a spiked lemonade. Serve in champagne flutes. Careful: a little goes a long way. If you and/or your guests don’t drink (like moi), may I recommend the easiest mocktail ever? Mix soda water (seltzer, whatever you call it) with a tiny bit of pomegranate (or another 100% fruit) juice. Add a slice of orange (or lemon, or lime, whatever you got) and serve in a fancy glass. Even the kids love this and it’s cheaper and healthier than soda. Make a veggie plate. Buy broccoli, cherry tomatoes, one yellow pepper, cucumber, carrot sticks, and celery, and cut up. Make a dip by mixing sour cream or plain yoghurt with dill, lemon juice, salt, pepper, and a little bit of garlic. Or use Ranch dressing. 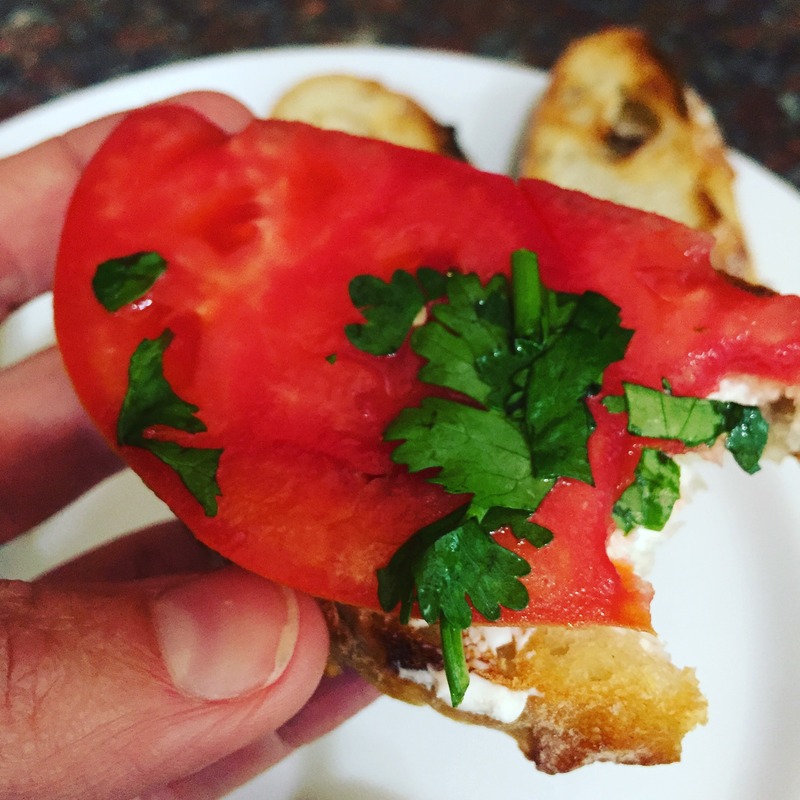 Bruschetta is a frugal, delicious appetizer to make. Cut a baguette into slices, brush with olive oil, bake for a few minutes in a 375 degree oven. Top with a mix of chopped tomatoes, cilantro, olive oil, balsamic vinegar. Then serve a bag of fancier potato chips. If you live near an Aldi, they have inexpensive cheeses and crackers. I usually buy two cheeses, one type of nut, and crackers. Or I raid my pantry and figure out what I have (recent plates include random sweet-y things Mr. ThreeYear brought back from a trip to Dubai several months ago. A lot of times, something new or foreign seems fancy so go for it). Appetizers you buy abroad seem fancy because they’re so rare. 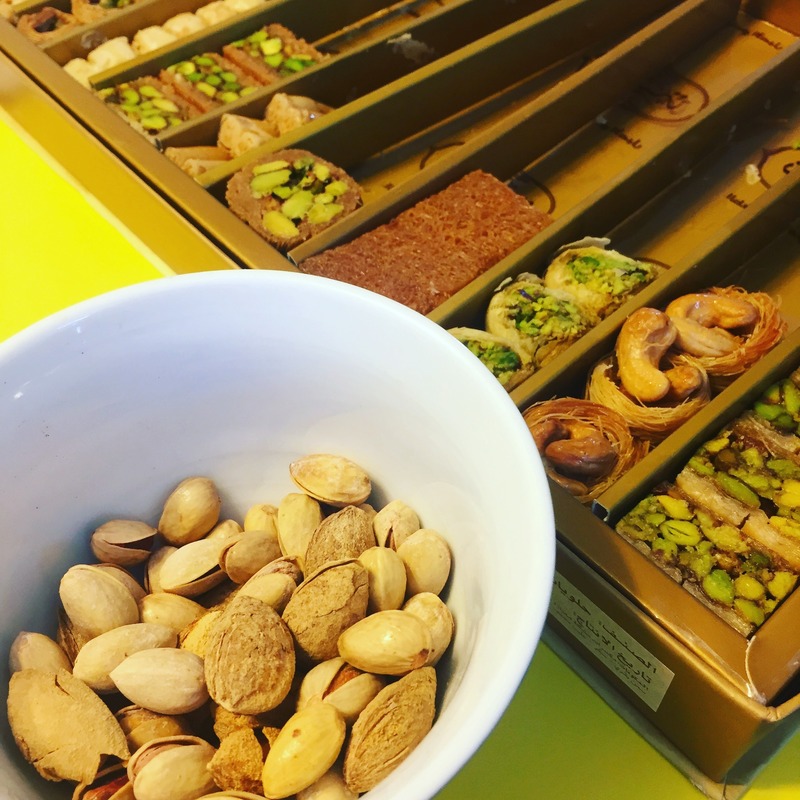 If you can, bring treats back from your trips and save them for entertaining your guests. The key to cleaning and decorating your house is focus. Just clean the downstairs where you’re going to eat. First, pick everything up that’s out of place and either put it back where it belongs OR put it in a giant laundry basket and deal with it later. Simple is better for the table. Set it with placemats, cloth napkins if you own them, and your cutlery. Don’t waste money on flowers. Either pick some from your yard, cut some branches from a colorful tree, or just put a bowl of fruit or candles in the middle of the table. Set out the glasses you think you’ll use next to the drinks you’re serving on your counter, and put out your appetizers a couple of minutes before your guests arrive (I usually make my veggie plate early in the morning then pull it out last minute. Gives the dip time to meld and taste better). 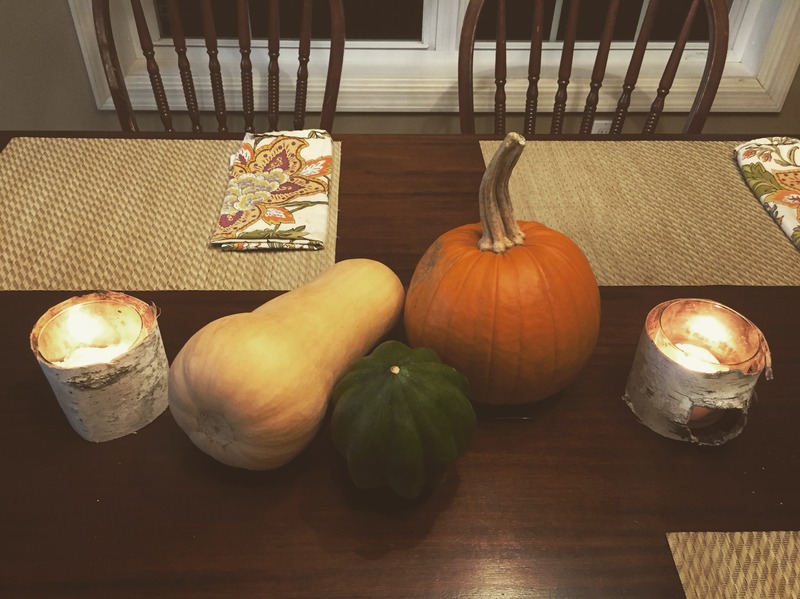 A frugal decorating scheme for fall (we ate the decorations later that month). Notice the mismatched candles–I covered them with birch tree bark I found in the yard. Also notice the easy-to-wash placemats, the only ones I own. Empty your dishwasher. That way, after dinner, just stick dishes in and start and clean up is faster. If you’re inviting people with kids (and you have kids too, or even if you don’t), make a separate snack for the kids (popcorn or more chips) and rent a movie for them to watch in another room after dinner (our guests go into the Master bedroom a lot and watch movies we’ve bought on our Apple TV or on Netflix). This way, the adults can talk and hang out and so can the kids. If the weather’s nice and you have a big backyard, consider moving everything outside after you eat, or eat outside, so the kids can run around while you talk. Or send them outside alone. Find three couples/people/families you want to invite over. Decide on your formula, then do it three times. The exact same meal. Exact same decorating scheme. Exact same drinks. That way, you’ll have a chance to practice and flex your entertaining muscle. 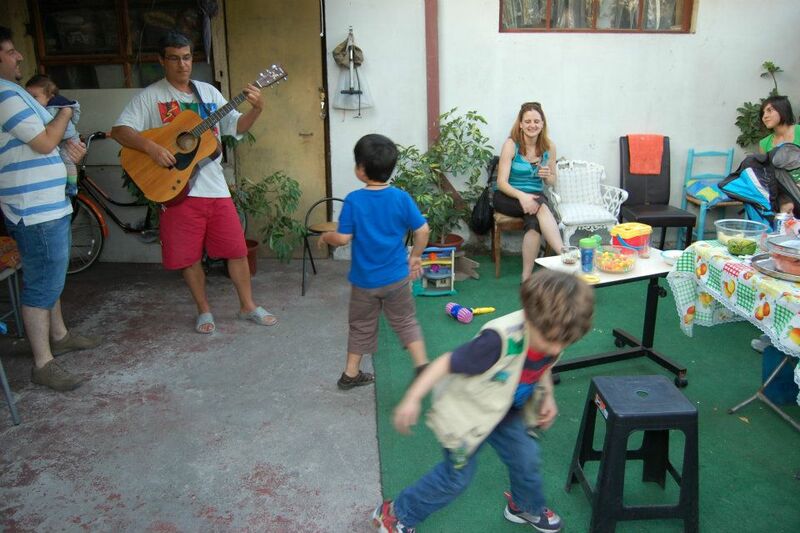 You don’t have to have a perfect venue to entertain–just a willingness to share yourself with your guests. Tell us the story of how you two met. How did you end up working where you work? The idea is to practice having people over, even if you feel like what you’re offering is imperfect. The very most important thing to offer guests is the gift of your attention, so all the other stuff is secondary. Remember: perfect is the enemy of good enough. I’d love to hear from you. 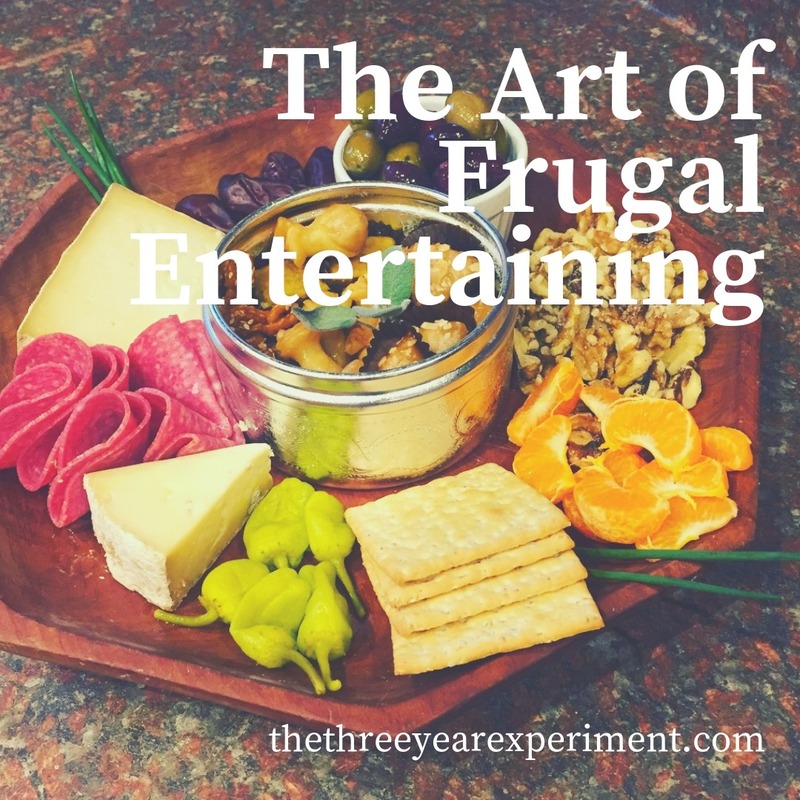 What are your favorite frugal ways to entertain? Previous Previous post: Is Focus More Important than Intelligence?